Description: The Oysterman Knot, also called the Ashley Stopper Knot, forms an attractive button anywhere on a cord. 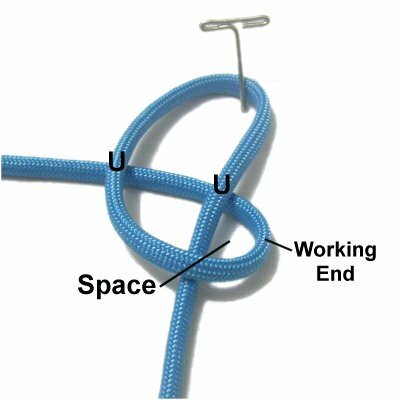 On this page are two methods for tying this interesting knot. 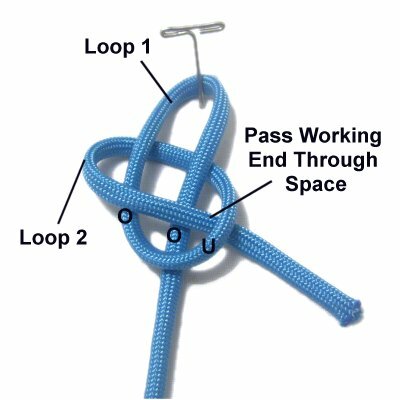 Developed in the early 1900s by Clifford W. Ashley, it is a relatively easy decorative knot to make. It's based on the Slipknot, but has an extra step. 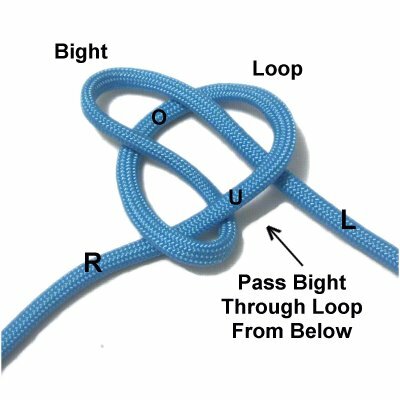 Most button knots are easy to tie, but complicated to tighten. Not so with this one, which makes it very appealing for many types of Macrame projects. 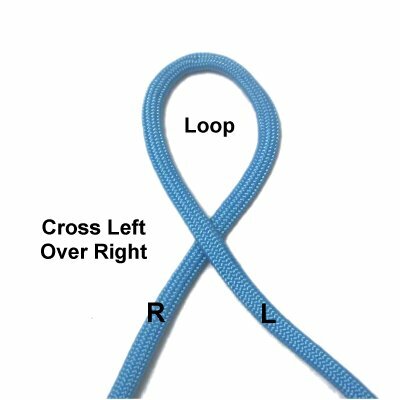 Below are two projects that feature this knot. Click on the links or images to visit the pages described. 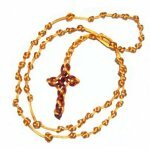 The Satin Rosary has Oysterman and Celtic button knots instead of beads. The Pandora Bracelet has Oysterman buttons between the beads. The Oysterman knot can be tied in two ways. 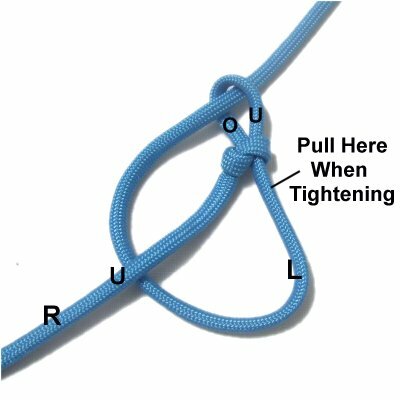 This method is used if you are tying this knot first, before any others are tied. You can make the knot on a project board or while holding the cord. Step 1: Make a loop at the center of an 18-inch cord. Make sure you cross left over right. Step 2: Fold the left half of the cord to form a bight. Pass it through the loop from below, which is under the right half and over the left. Pull on the bight to tighten the loop around it. Step 3: Arrange the Slipknot vertically. Move the left half of the cord in a clockwise direction, passing under the right half of the cord. Bring it to the bight and pass it through from the top, which is over - under. Step 3, continued: Tighten the Oysterman Knot by pulling on the left half of the cord in the area just below the Slipknot. That will tighten the bight. Then pull the left half of the cord to tighten the rest of the knot. This is front of the completed knot, which resembles a rounded square, with four segments. The back has three segments. This method is the most common way the Oysterman knot is tied. 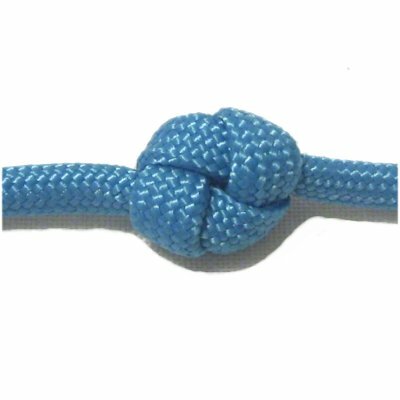 It's used when you have other knots present, or when you are placing it near the end of a cord. This method is easier to tie if you use a project board. 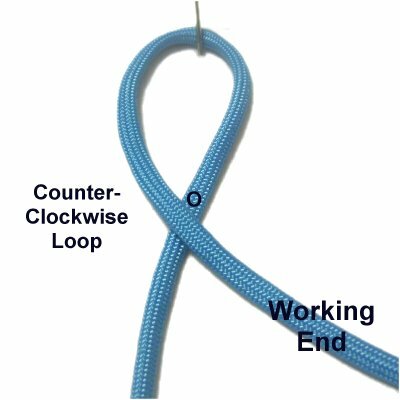 Step 1: Make a counter-clockwise loop with an 18-inch cord. The working end will be on the right when you are finished. Step 2: Bring the working end under both sides of the first loop, heading right to left. Locate the space indicated next to the working end, in the area where it curves. Step 3: To complete loop 2, move the working end over both sides of loop 1, heading left to right. Pass it through the space, coming out from under the curved segment. Pull the working end to tighten loop 2 around loop 1. 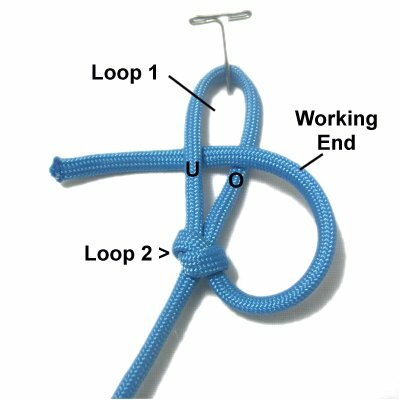 Step 4: To complete the Oysterman knot, pass the working end through loop 1 (over - under), heading right to left. Pull on the working end in the area below the tightened portion (loop 2). That will tighten loop 1. Then pull on both ends of the cord to tighten the rest. Have any comments about the Oysterman Knot? Contact Me.